Thanks Ailsa for another travel theme. 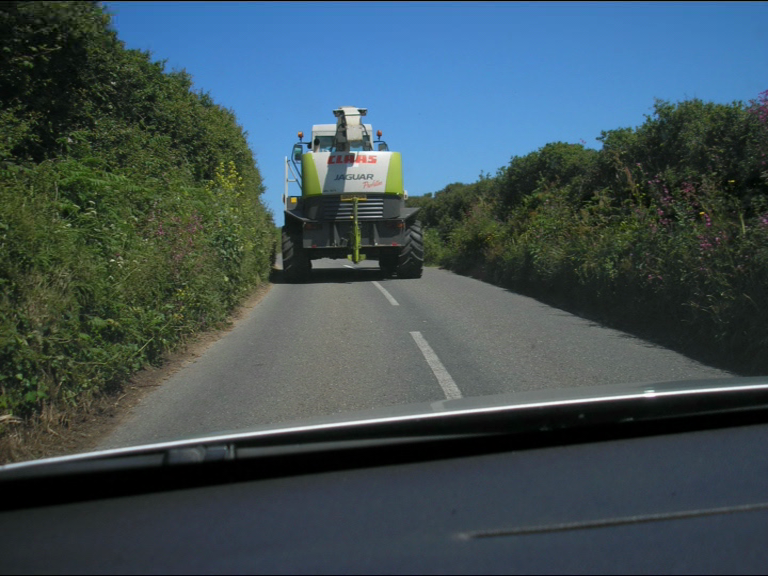 Sometimes, “slow” is the only option, especially when following farm machinery on Cornwall’s narrow roads. Believe it or not just before this photo was taken a double decker bus passed going the other way. Who’d have even thought there was room? Taken on my holiday with Mum in 2007. Previous PostSunday Stills: The Long (and not so Winding) RoadNext PostTravel Theme: Freedom – at least one of us made it out alive! My personal favourite slow moment was sitting behind a flock of sheep on a narrow road in Somerset. There was nothing to do but hurry up and wait, but some impatient people seemed to think if they kept edging forwards it would somehow make the sheep move faster. It was very funny to watch.